The scope of this course is to provide an introduction to topological quantum matter in one-dimensional systems, and to the most successful non-perturbative tool to access their dynamics — the density-matrix-renormalization-group (DMRG). Some general references (even well beyond the scope of this course) are the (great!) lecture notes by Motrunich, and the KITP lecture by Lee on spin liquids and magnetism. Finally, a resume of some of the topics discussed here and the Nobel prize in Physics 2016 to Haldane, Kosterlitz and Thouless is available at this link. On the DMRG side, White’s original paper is a classic that must be read . There are plenty of useful reviews, including many from an MPS perspective . If you’re interested in open source codes, the documentation of ITensor provides a concise, yet very clear introduction to MPS. I will not follow a specific book or review, but take inspiration from various sources on the different topics. Some useful references are indicated below [in progess]. Students are expected to have a solid background in quantum statistical mechanics, and should be already familiar with basic concepts in numerical methods (linear algebra basics) and renormalization group theory (either from a high energy or statistical mechanics perspective). A partial review of those, including Kadanoff’s RG and numerical RG, will be undertaken at the beginning of the course. Basic knowledge of one-dimensional field theories (bosonization, conformal field theories) will be useful but is not required. Some knowledge of non-interacting topological insulators might also be helpful (see Giuseppe Santoro’s talk) but is also not required. The course will take place in spring. It will be made of 10 lectures. All lectures will be blackboard type. A few numerical experiments will be discussed with the help of a projector. Part I — setting the stage [2 lectures]: some basics on topological matter. the integer quantum Hall effect: gauge invariance argument and TKNN. Part II [2 Lects]: Haldane’s conjecture and the emergence of topological order in one-dimensional systems. string order, hidden symmetries, and Kennedy–Tasaki transformation. On the nature of the hidden order, a very good reference is the long article by Kennedy and Tasaki  (pay attention to few typos in Sec. 2). 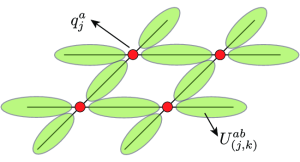 A good reference on antiferromagnetic spin chains is the review article by Affleck , a bit old but excellent in terms of field theory insights. Part III [2 Lects]: topological insulators and non-Abelian anyons. The best reference on the Kitaev model is Kitaev’s original article [6, 8]. A nice review by Ludwig provides a relatively up-to-date account on the classificaton of non-interacting fermions , which has an especially clear part on Anderson localization. beyond Majorana: parafermions and clock chains. Bonus part [2 Lects]: true topological order, gauge theories and spin liquids. The main references for this part are Chapters 9 and 17 of Ref. , the review by Kogut  and the original article by Kitaev . For entanglement and topology, nice articles are the review by Regnault , and Hermanns . An excellent, overall reference for this first part is the collection of contributions included in the volume . For dualities in condensed matter, a good reference is the chapter by Fisher in the book collection edited by Bareswyl . braiding statisics, anyons. Examples with the toric code. Part IV [2 Lects]: matrix product states: introduction and theoretical applications. edge modes and MPS representation of topological states. Part V [2 Lects]: matrix product states and time-evolving block decimation (TEBD). a DMRG application to topological matter: numerical experiment on Haldane’s conjecture (partly as an in-class demonstration). There are two ways to take the exam. Oral exam: this consists of a small review talk (of approximately 30 minutes) to be given at the end of the course over a certain topic related to topological matter (not necessarily covered over the course). I strongly suggest you take the initiative by proposing something which is of your interest — we can then decide together more specifically which articles should be covered by your review. Hands-on exam: this consist of reproducing in some detail a paradigmatic result covered over the course with the help of computer simulations (or with analytical methods in specific cases), writing the corresponding (simple) code and briefly presenting it to your peers with a 15 minute talk. In case you feel brave enough, we can even think about a more challenging project, maybe on yet-to-be investigated scenario — which can, obviously, be carried out within reasonable timescales. Ian Affleck. Quantum spin chains and the haldane gap. Journal of Physics: Condensed Matter, 1(19):3047, 1989. Matthew P.A. Fisher. Duality in low dimensional quantum field theories. Strong interactions in low dimensions, pp. 419–438, Springer Netherlands, Dordrecht, 2004. E. Fradkin. Field Theories of Condensed Matter Systems. Cambridge University Press, 2013. M. Hermanns. Entanglement in topological systems. arXiv preprint, arXiv:1702.01525, 2017. Tom Kennedy and Hal Tasaki. Hidden symmetry breaking and the Haldane phase in s = 1 quantum spin chains. Communications in mathematical physics, 147(3):431–484, 1992. A Yu Kitaev. Unpaired majorana fermions in quantum wires. Physics-Uspekhi, 44(10S):131, 2001. A Yu Kitaev. Fault-tolerant quantum computation by anyons. Ann. Phys. 303(1):2–30, 2003. Alexei Kitaev and Christopher Laumann. Topological phases and quantum computation. Exact Methods in Low-dimensional Statistical Physics and Quantum Computing: Lecture Notes of the Les Houches Summer School: Volume 89, July 2008, 89:101, 2010. JB Kogut. An introduction to lattice gauge theory and spin systems. Rev. Mod. Phys. 51:659, 1979. C. Lacroix, P. Mendels and F. Mila, editors. Introduction to Frustrated Magnetism. Springer Series in Solid-State Sciences 164, 2010. Andreas WW Ludwig. Topological phases: classification of topological insulators and superconductors of non-interacting fermions, and beyond. Physica Scripta, 2016(T168):014001, 2015. N. Regnault. Entanglement Spectroscopy and its Application to the Quantum Hall Effects. arXiv preprint, arXiv:1510.07670, 2015. Ulrich Schollwöck. The density-matrix renormalization group in the age of matrix product states. Ann. Phys. (N. Y)., 326(1):96, jan 2011. Steven R. White. Density-matrix algorithms for quantum renormalization groups. Phys. Rev. B, 48(14):10345–10356, oct 1993.